I finished this book within a few hours and it left me feeling... in awe. This story took me for a whirlwind and just didn't let me go. I started reading this book with a bit of skepticism because of the writing style. At first, I wasn't sure that I was going to like it because the writing reminded me of poetry. It was very whimsical and descriptive, and I wasn't sure if I liked it, but I kept reading despite this. I am really glad that I did! What I stumbled upon was a young adult book like no other that I have read in my life. This book was unique, and not just in the plot line. The emotion that spilled out of the pages captured my heart. Connor felt real sorrow, and I felt it with him. He was such an ordinary character that I found myself falling in love with him more than the typical macho guys we see in young adult books today. Jade was another character all together. I kept reading solely to find out just what she was, I was intrigued throughout the book, and found myself frustrated when I didn't exactly understand who or what she was. The author presented her story in a way unlike anything I have read before. I guess I was just caught off guard in Jade's storyline, and I just didn't know what to think. At times I found myself thinking that maybe she was just mental, but what I found out in the end threw me for a whirl. In the end, I found myself loving this book just because of it's uniqueness and deep emotions portrayed throughout the book. When I finished it, I just didn't know how to feel... and that's normally how I know when I have read a truly extraordinary book. Congratulations Rochelle, you definitely took me off guard on this one. This is a stunning debut that I would recommend to anyone looking for something unique in the young adult world. 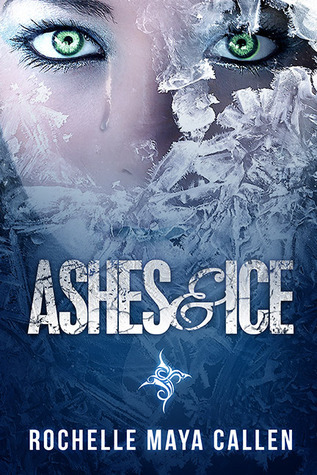 I will be participating in the release day blitz for this book on February 4th, so look out for this if you're interested in reading Ashes & Ice. Well, the short of it is: I grew up with a book under my arm. I frequently read until dawn by flashlight so that no one could see I was up by the light under my door. I scribbled stories in the corners of notebooks and was convinced I would be a novelist one day. And then *BAM* twelve years later it happened! Ohhhhh....this sounds really good! I will be looking out for your release day blitz post! p.s. That cover is pretty amazing. The cover is beautiful! I love it. :) Also, it was really good! It definitely left me speechless. I am in love with this cover! So pretty! I definitely like how you point out this is a unique story, I love novels that tell a new story. Great review! Wow, I love that cover. I had never heard of this title before. Thanks for sharing! Great review. I can't wait to read it!